All the features of the SRViper M-TX 153 plus FOX® FLOAT® 3 front and rear suspension. Legendary Yamaha Clutching: The SRViper M-TX 153 SE uses the legendary Yamaha YVXC clutching. Easily the most reliable and durable clutch system in the industry, the YVXC has evolved to efficiently handle the unique power characteristics of the Genesis 4-stroke engine. Multi-purpose magnesium chaincase: The SRViper M-TX 153 SE's chain case and cover serve as both a mounting point for chassis spars and the engine's oil reservoir. Lightweight magnesium construction minimizes weight. High performance Hayes Brake system: The SRViper M-TX 153 SE's high performance Hayes brake system delivers stopping power with a large-diameter, 8-inch rotor. Mounted low on the drive shaft, you feel immediate whoa-power with a quick stab of the brake. The hydraulic brake's race-inspired radial master cylinder design gives you excellent leverage when needed, with precise brake feel and control. 15 x 153 x 2.6-inch Power Claw track: If deep snow capability is critical to you, then the M-TX 153 SE's Power Claw track is an important feature. The 2.6" lug can move a lot of snow, and its floatation ability is nothing short of phenomenal. The durable, yet lightweight design offers performance and efficiency. For riders who are serious about their deep snow riding, the Power Claw is the ace up your sleeve. SRV-M Front suspension: The SRV-M front suspension geometry is aimed at managing spindle camber, resulting in minimized bumpsteer and maximized cornering bite and rider confidence in varying trail conditions. The a-arms are mounted at a 30-degree angle from the sled's centerline to efficiently dissipate impact force throughout the entire chassis. Likewise, the front shocks mount directly to the leading spar so that trail forces are routed to the strongest part of the chassis. Wide a-arm spacing minimizes flex and stress in the front suspension system, which means consistent and confident corner handling. Adjustable ski stance: The ski rubbers on the SRViper M-TX 153 SE are asymmetrical, with a portion of the part serving as a spacer for the ski. 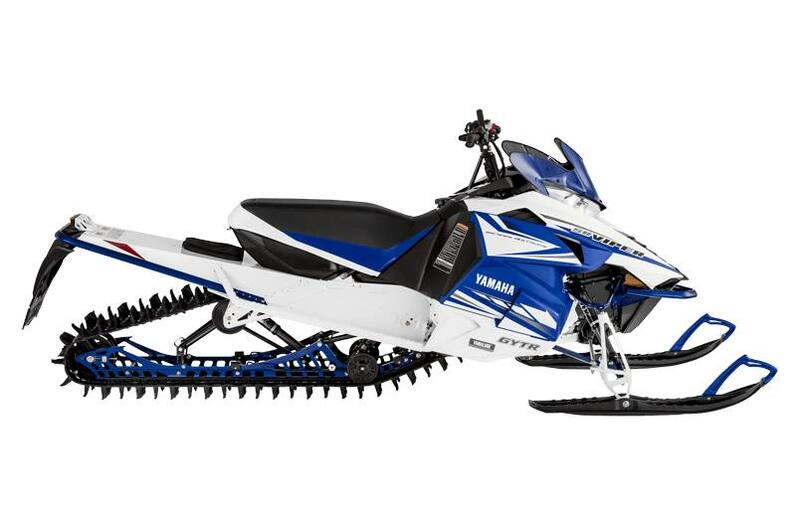 This allows riders to adjust the ski stance on the M-TX SE from 38 to 39 inches, center to center, by simply switching the ski rubbers from left to right, and right to left. Over-the-engine steering: The straight steering post on the SRViper M-TX 153 SE is configured over the engine. It connects to a single bell crank for simplicity and light weight. The design also minimizes freeplay in the steering system and delivers a tight turning radius. Plastic mountain ski: The SRViper M-TX 153 SE's plastic mountain skis offer extra width for excellent powder handling characteristics. The unique arched fin design of the ski also deflects snow away from the sled and the rider. The mountain ski also features traction grippers molded into the tops. Tall, hooked handlebars with center strap: To match the SRViper M-TX 153 SE's tall and forward riding position, a single-piece, dual-hooked handlebar is standard fare on. The hooks have the same grip material as the main bar section, for consistent control, regardless of hand position on the grip. 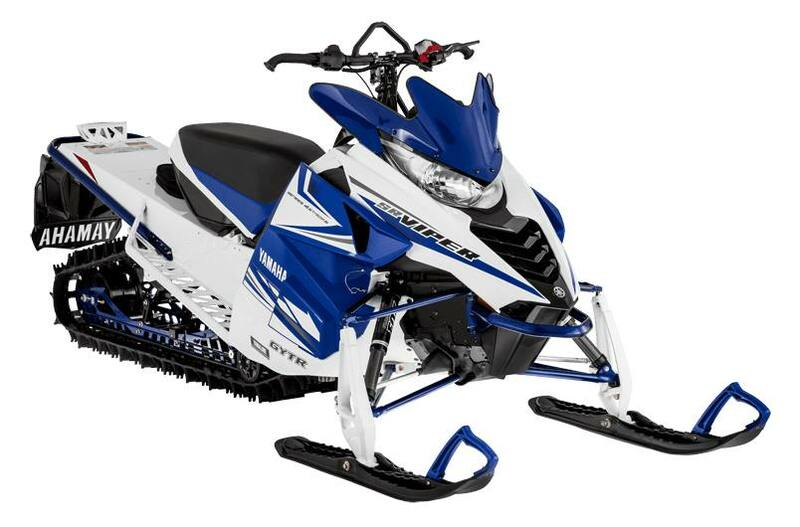 The M-TX 153 SE also sports a tough center grab strap for additional leverage options in deep snow. Performance-tuned FOX® FLOAT® 3 front shock package: The SRViper M-TX 153 SE's performance-tuned Fox® FLOAT® 3 shocks use an air spring designed to force the piston to rebound. This eliminates the need for heavier steel coil springs. The air springs are individually tunable by using a pocket-sized air pump, which comes with the sled, so consumers will be able to set the front suspension up to their liking. Dual Shock SR 153 rear suspension: The uncoupled Dual Shock SR 153 features a FOX® FLOAT® 2 air shock on the rear arm, combined with aluminum-body HPG shock for maximum control and ride comfort regardless of whether you're riding on or off trail. The rear axle features a conjoined rear wheelset. The ingenious design is lighter, more durable and more rigid than most traditional rear axle wheels. Tapered tunnel design: The SRViper M-TX 153 SE's two-piece, tapered tunnel gives you strength for the long haul and a tapered "fit" for enhanced leg comfort and overall ride positioning. Large fuel tank: The SRViper M-TX 153 SE's generous 10.6-gallon fuel tank combines with the Genesis engine's acknowledged fuel efficiency to keep you going longer. The M-TX 153 SE's efficient design philosophy means that even the fuel tank serves multiple functions. Not only does it carry gas for a long day, but it also cradles the battery and is the platform for the quick-release trail seat. Tall, sculpted seat: The seat foam on the SRViper M-TX 153 SE is anatomically designed to comfortably put the rider in an aggressive posture with easy transitions from seated to standing to leaning into a corner. Standard electric start: Yamaha's electric starter system allows consumers to fire up their SRViper M-TX 153 SE with the turn of a key. There is no pulling on a nylon cord to get this high-tech engine growling! 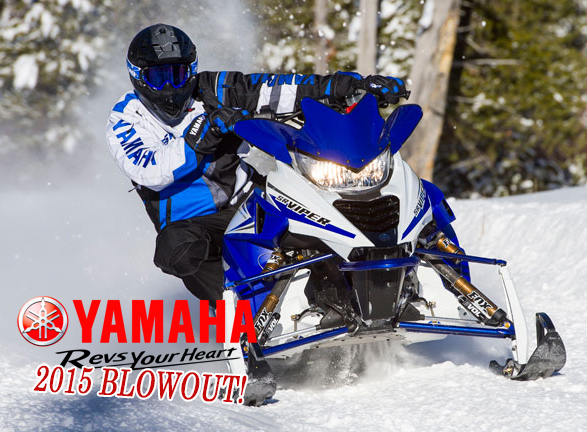 Electric start is a standard feature on all of Yamaha's 4-stroke machines. Track Dimensions 15 in. x 153 in. x 1.75 in.